I have COPD. I use oxygen. This item is great for me. I don't have to become breathless while cleaning. Saved me from trying to stoop. I was dropping and breaking glasses as I did not have a good grip. It hurt badly to try to stoop down to pick up pieces. The broom and dust pan were just the right solution for me to sweep up everything from the floor without bending. Later I ordered one for my little great-granddaughters because they like to help their grandmother when she is cleaning. Saves you from a lot of bending. Great for quick clean ups. With arthritis, bending is difficult. This saves me from the painful struggle! I AM A DOUBLE AMPUTEE. I AM IN THERAPY TO EVENTUALLY BE ABLE TO WALK. UNTIL THAT TIME, THE BROOM AND DUST PAN SET IS EXCELLENT FOR ME. IT IS THE PERFECT LENGTH. I HAVE NOTHING NEGATIVE TO SAY ABOUT THIS PRODUCT. Not having a lot of strength, makes this broom and dustpan easy to handle and they are not heavy. I just love this! SO easy to use, lightweight, and the dustpan is flush with the floor so there isn't alot of backing up, sweeping, backing up, sweeping to get it all in the dustpan. Love it and use it every day. I keep this in my kitchen - family room and use it constantly as dirt is racked in from outside. Other people have used mine and I have ordered them one as a gift. I have little dogs that spill their dry food a lot. This makes it easy to clean up. I don't have to bend over. I like that it's so small it tucks out of sight right there in the kitchen where I need it the most. No more trudging to the garage for the broom. It's small, but it works just fine. Absolutely love my broom and dust. Really love the size. BeautifuL. it comes in pieces and needs to be glued togerther otherwise it's great! It is really effective for me. I love that I don't have to bend and stoop to get the work done. I had bought this before & loved it!! They are great i have brought 3 toal in the past my daughte. The dust pan with broom is very handy and does an excellent job. I always keep two inside my home. One is used in the kitchen, and one is used in my bird room for my three birds. The only feature that is not great is every time I purchase a new one the handles must be glued to prevent coming apart. I found this perfect for sweeping up my kitchen floor, and sweeping up scattered birdseed under my parakeets cage area. Fits the bill perfectly! Does not take up a lot of room, and is lightweight and easy to use. Several years ago, purchased one & used it forever; however, it wasn't made as well as this one. This 2 piece unit is designed better; also better grade plastic. I will buy again if this one breaks. I use this in the kitchen. Chopping and cutting up food and getting them all over the floor, this item is light weight and easy to stay cleaned up.Matter of fact it's easy to grab for any small clean ups anywhere in your house. This is a great product for those of us that can no longer bend or stoop like we used to! Excellent at getting all the dirt into the pan - doesn't leave the dusty line behind. Excellent for quick pick ups like cat litter. Had to glue the two pieces of the handles together so it wouldn't keep coming apart, but not a big deal; otherwise have no problems whatsoever! Wish I'd have ordered sooner! Great little broom to get leaves off the deck!! The product is easy to assemble and disassemble for storage. I use it in my craft area, where I make cards. But it is a good compact size, and very light weight. VERY USEFUL TO PICKUP TRASH FROM FLOOR. GOT A SECOND ONE FOR THE OFFICE. This works great on short nap carpet and vinyl floors. I glued the two pieces together so they would not keep coming apart and that has made it so much better. I use it mainly for the cat litter on the carpet in between vacuuming and a quick sweep around the kitchen after cooking. Even my grandkids get a kick out of using it. Best idea and would highly recommend. This product is used by my mother who hashad both hips replaced, has arthritits and has difficulty with bending down from the waist. She uses this product to sweep all the floors in our house. She is very happy and just wishes the product would bend to store. Best broom and dust pan ever. Really enjoy the dustpan due to chronic back pain. This is one of the handiest cleaning tools I've ever used. It's lightweight and even kids love to clean with it. I uae this to clean up in sewing room and clean up after my cat. I like for it is lightweight and I don't need to bend to pick up the dirt. and my 2 year old granddaughter loves it. I have liked my long handled dustpan and broom so well I have given them to my daughter, my daughters-in-law and several friends. They, as well as I, like the easy of storage of the dustpan and broom when finished using it and the easy of use. NO MORE BENDING over to sweep up the dust/dirt. The broom is especially nice in cleaning the bath room and getting into tight areas. It is very handy for quick pick ups and very useful. Every home should have one when you need a quick clean up. Great broom and dust pan combo! I love these long handled dust pan and mini brooms, I keep a set in kitchen and my two bathrooms and use them throughout the house. When the set in my kitchen wore out, I looked high and low for a replacement, nothing locally and came up short online until doing a search on my old family standby, Walter Drake. Not only did they still carry the item it was on sale. Received the broom and dustpan today less than ten days after ordering and could not be more pleased. Well constructed and compact, the red color is a perfect match to my kitchen decor! This so handy to have especially in the kitchen. This product is wonderful!!! I love it. I have several of them all over my house!!! If it is difficult for you to bend over, this is the perfect tool for you. It is perfect for my handicapped roommate to use. Makes it easy to sweep up anything without stressing your lower back. Avoids the pain of bending for anyone with lumbar spine problems. Sections of handles kept falling apart so I applied a dab of rubber cement to each joint and now it's perfect! You could also use super glue etc. but be sure you align the handle with the pan or it won't hang the broom correctly. Really fun to clean without bending !!! Pleasure to pick up floor litter without bending !! This works perfect for daily clean up where the Grandkids eat. I don't have to bend over or mess with a big broom just for small sweeping jobs. The one problem with it is, I couldn't get the little bracket to come down so that I could click them together as shown in the picture. Great product for a double amputee who still likes to help! My husband is a doublel amputee so he spends a lot of time in his wheelchair. He has his own room to build models, reloads, and use his computer. He likes to clean up his own messes and this product is just the right height to sweep the floor. He even swept the kitchen floor today. I also use it also to sweep up small messes. This is a great inexpensive item and sure helps with people with bad backs and the elderly. The only thing is that the broom part gets loose and falls a part but with a little supper glue it will always stay together. Easy fix for this. A handy broom and dustpan. small, easy to store, quick and efficient. the handle comes apart from the dustpan sometimes. I glued mine together so works fine now. WITH MULTIPLE SCLEROSIS BEING MY CONSTANT COMPANION, I CAN'T LEAN OVER WITHOUT FALLING ON MY HEAD. I LOOKED "EVERYWHERE" BEFORE BUYING THIS LONG HANDLED DUSTPAN WITH SHORT BROOM. NOW I HAVE 3: KITCHEN, HUBBY'S TOOL "SHED" AND MY SEWING ROOM. Pick up things that spill on floor in kitchen. The best thing about the Long Handled Dust Pan & Broom is that you are not bending as far to sweep up the mess. Also the fact that once you sweep the mess (dirt, crumbs, etc.) into the dust pan they stay there because of the small lip in the dust pan. I bought it for my Mom & my Aunt saw it & said she wanted one too. so I bought her one for Christmas. This is a great broom to help with quick and frequent cleaning of the kitchen. It is lightweight and easy to use. The small size is even easy enough for kids to handle and even help out with sweeping. Best of all, it doesn't take up too much room and does not hurt my back when sweeping up the dust. The only drawback is that I wish the handle was one piece. Sometimes it comes apart with frequent use. easy to assemble, easy to use & great back saver. Great for me since I am handicapped. Can use on any job that needs a cleanup. Can store in any empty corner or space. stick for the dust pan should have one more stick to it so instead of 2 it needs 3. I have a hard time with the 2 sticks so I took one stick of the broom and attached it to the dust pan which makes it now 3 sticks for the dust pan. Now I can sweep with a regular broom (the one I got from you now is useless unless you want to add 3 sticks to the broom also) and use my longer dust pan which helps me a lot. I have back problems and the 2 stick broom would let me bend over too much. I use the broom on my work cart at a Nursing Facility so it get a LOT of use! The only problem I have with it is the sections come apart easily---HOWEVER, I use Superglue and that does the trick! This is a great, lightweight broom! I ordered this for myself a while ago. The new one I just ordered is for my two year old grandson (he and his family are living with us while they wait to move into their new house). He loves to play "sweeper" and this is the perfect size for him, so I bought him his own set. But my review of this product in real use is that it's very convenient (especially for someone with back issues) to have the dustpan on a tall handle. Also, I had my husband glue the handle together for me (it comes as separate pieces) to make it easier to use and store. I do wish that the handles were either a little longer or telescoping but, for the price, the quality is good and I've used my original set for a couple of years now without issue. Good buy for small floor pickups. The height is just right for me, a short person. The only problem was the broom came aparr 2 or 3 times when I tried to use it. I put a piece of clear tape around one of the tubes and pushed them together. Hasn't fallen off sonce. Easy to use for quick clean up. Glad I ordered it. The parts fit but immediately come apart. Just use a good glue and the broom/dustpan combination is very convenient for small messes that need to be swept up. Bending is hard for me so this product is perfect. A great thing to have. I have always seen this used in restaurants of in places of business and I always wanted one. It save stress on my back because I was using a brush and dust pan. It a good thing to have. The product works well and stays together when storing it. However, the broom handle could be a little longer. No need to bend over as much if your taller than 5'3". This is the 3rd set I have purchased. I really like this product, no more bending or having to get on the floor. Just sweep the floor in to the dustpan and your done. Perfect for people with back problems! as a disabled individual, this is a great product. easy to put together, easy to use. i am a bit concerned about the seeming flimsiness of the product but time will tell if that's real or just my imagination. I recently had surgery, and this item makes it much easier for me to pick up messes. NOT THAT GREAT AND NOT THAT BAD BUT SHORTER THAN THE AD . Product is of poor quality. I use it mainly in the kitchen and bathroom. Find it very hard to use the broom is so flimsy and it's difficult to get the dust out of the dust pan. The dust pan seems ok, but the broom keeps coming apart. Since space is an issue this broom was just the right size to quickly clean up messes, then store it away. Not heavy, but I would have liked the handle to be alittle longer. Needs to be made a bit stronger in construction. The set is like a toy set. The dustpan is good so u don't have to leanover to use it. The broom is just a toy. The handle kept coming out of the pan and the broom handle kept coming apart. Then I got the idea to glue the parts together and now it works great. Price is right for the item. A bit shorter then I imagined. OK, but I wish the handles were longer. Dust pan did not fold up so it doesn't work for me. The broom keeps coming apart and it's much shorter than I thought. My grandchild thought I had purchased it for him to play with. I have back problems and this item does not help. I looked everywhere for a long handle dust pan and was please to see it here so I ordered. The dust pan was ok but the broom was way too small. Not even a little kid could use it. It was not of good quality but did not want the hassle of sending back. I was dissapointed with the product but I use the dust pan anyway. The dust pan on the long handle is a great idea, however there is a lip on the duat pan that makes it practicely impossible to sweep onto. The pole wouldn't stay together, had to glue them. Very light weight & short, is like a child's toy. Very flimsey. I had to glue pieces together. When trying to use the handles kept falling apart. Overall a good idea. I thought these were cute and would be functional, but they just come apart too easily. I don't have the energy for that. Very cheap plastic. Expected a nice sturdy dustpan for the price. Broom comes apart, each time I sweep. Not real happy with this purchase. used to clean up around my plants where leaves fall off or light trash in the kitchen floor. I bought for the comfort of not having to bend so much as I have a bad back. Rather flimsy and falls apart easily. This price was significantly lower than anywhere else I've seen. What the photo doesn't show is that the broom handle ships in two pieces, which you then connect at mid-pole with a connecting "tube". My handle comes apart often. I use this mostly to sweep up cat litter around the litter boxes. At some point I will probably superglue the two pieces together. Long Handled Dust Pan is too short. It's cheap plastic. It's small. Someone said the best thing is to give this to a child. I agree! If I had seen this in the store I would never have bought it. 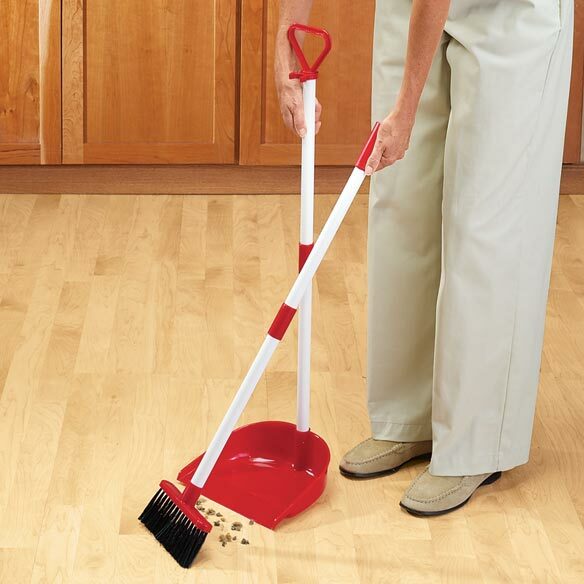 Great for sweeping crumbs, dirt, etc from the floor for a temporary clean. Have used a much prettier and sturdy selat for years - was looking to replace. But was ordering based on red color pictured to match decor, but was shipped a teal & white color. No Bueno!! Was disappointed - passed it one to someone else. Will just find where I bought the other one and order a new one from them instead. The broom is in 2 pieces that fall apart continuously! When it's together (which I have to constantly tighten) it is great. I cannot bend so it is VERY handy. However , I would rather pay more and have the handle in one piece. Can't pick up when it falls on floor in 2 pieces at the connection . But, I use it to pick up dirt and whatever on the floor that I can see and for this, (and I tighten the connection every time)it does the trick. This item had a written notice that it was toxic. doesn't stay together had to glue it. The bottom part of the broom always falls out of the handle. I'm thinking about using super glue in the handle so it will stay attached. It wasn't expensive so I'm not too disappointed. I feel like I got what I paid for! However I love your company and your products. This is useless and is going back! Lousy!! The handle on the broom keeps coming apart. Used broom and dust pan to pickup between vacuum. cheap plastic. Not worth the money. Was hoping it would be taller and of better material. I needed to sweep my kitchen! It is hard to sweep the dirt in the pan! the broom is flimsy. I can't say much that's good about this product. If you glue the top on, it might be used by a child who wants to help Mom or Dad do the cleaning. It's poorly made. The dustpan is flimsy and curved into a slight U-shape, so a lot of the dirt and dust is just brushed underneath it. A second attempt won't help, because the shape just won't accommodate anything small. If you're the type who doesn't mind leaving a pile of dirt behind and just getting the big chunks, this might be ok for you. If you actually want to sweep up all that's on the floor, you'll want something that's made much better than this. Broom is very flimsy and falls apart. Cheaply made and not worth the money. Had another one before this and was much more sturdy. Extension rods keeping coming apart. Biggest complaint is the dust pan does not have rubber lip so dust goes under instead of in the pan. Also its really short. The lip of dustpan is so thick and blunt that you can't sweep anything into it. It is completely useless. Cheaply made. Plastic is warped. When you sweep the debris goes UNDER the pan in stead of in it because the pan does not sit flush with the floor. It was a joke. There is no long handle. I am sorry i spent almost $20.00. It is rubbish that can't clean any rubbish! The dust pan is great BUT the broom OMG its the cheapest thing I've ever seen. If the handle was sturdy it be great BUT it bends and is flimsy like a rubber band. Couldn't even use it. The broom keeps coming apart...very annoying.will have to most likely glue it to stay together. Dust pan not long enough. Disappointed,dust pan not long enough.Broom and dust pan poor quality. Worst broom and dust pan, kids play set is better than this. I was hoping that this product would be a convenience when I don't want to use the vacuum cleaner. But it falls apart easily. Don't waste your money. does not work ..dustpan is not flat. Love these because they are easy on the back. With back problems, this product makes sweeping so much easier on my back instead of bending down to pick things up. I posted a comment before I ordered. Looks like what I can use. I said my wife wanted it. Time for a new one. Use it all the time, difficulty bending/stooping. I actually have had a dustpan set for years and I use it frequently. The rubber part on the dustpan has torn in places because I've used it outside a lot. This one will be for inside the house only and I love red. for my housecleaner.Hard to find a broom like that anymore. because of the short handle which I hope is handy in my bathroom. I chose this item to use for quick pickups in the kitchen. I chose this so I would not have to bend over to clean up items on the floor. does the dustpan have a rubber tip along the front edge?